Cultural, historical and artistic monuments should reflect the diversity of a place and its people. People of color and women have been vital to the creation of Los Angeles throughout the history of the City and the area. Yet with almost 900 official cultural and historical landmarks in the City of Los Angeles as of January 2008, only about 76 relate to people of color, women, and Native American tribes. Images of 60 of those diverse monuments are shown in the The City Project’s Monuments, Diversity, and Democracy set on flickr. Things are not getting any better as Los Angeles gets increasingly diverse — only about 16 out of 199 monuments since 2000 relate to people of color or women. 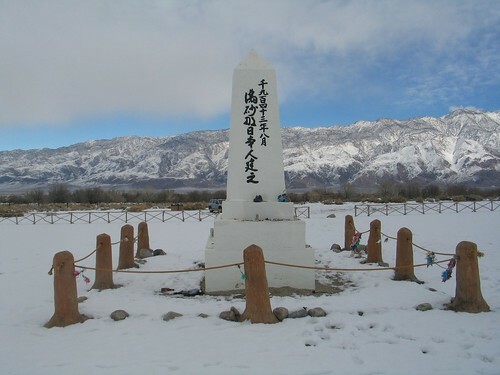 Manzanar is a best practice example of a monument that honors diversity, democracy, and freedom. In contrast, community members, activists and advocates have identified over 100 links along the Heritage Parkscape to serve as a “family album” for diverse communities from the Great Wall of Los Angeles to the Rio de Los Angeles State Park, the Los Angeles State Historic Park, and El Pueblo de Los Angeles. Prof. Judy Baca and SPARC, Mujeres de la Tierra, and The City Project presented public comments to the Los Angeles Culture and Heritage Commission on April 17, 2008. The comments make two major recommendations. The first is to redefine the criteria for designating monuments. The second is to redefine the responsibilities of the Commission. Both should promote cultural, historical, and artistic monuments that reflect diversity and democracy. The Ordinance should be revised to reflect the following principles. The collection of monuments should faithfully, completely, and accurately depict the history and diversity of Los Angeles, including people of color, women, and workers. Monuments should stimulate and provoke a greater understanding of, and dialogue on, diversity, democracy, and freedom. The Commission should provide leadership for the protection and interpretation of such monuments, resources, and places. Best practice examples of monuments and public art that celebrate diversity, democracy, and freedom include the Great Wall of Los Angeles, Manzanar, Biddy Mason Park, Little Tokyo, and Colonel Allensworth State Park. Public art in the new Los Angeles State Historic Park at the Cornfield site should highlight the struggles, hopes, and triumphs of the generations who have entered Los Angeles through El Pueblo and the Cornfield to reflect the dreams of the community, the purpose of the park, and the vision of the Cornfield Advisory Committee. “Public Art in the Public Park: People, Place, Power in the Los Angeles State Historic Park” sets forth the vision for the park as expressed by the communities that struggled to create it. Public art in the public park should reflect the values at stake to bring people together – providing children the simple joys of playing in the park, improving recreation and health, equal access to public resources, democratic participation in deciding the future of the community and park, educating the public, local jobs for local workers and economic vitality for all, spiritual values of promoting peace and justice, and providing the clean air, water, and ground benefits of safe and healthy urban parks. – “The first of three movements, ‘Speaking Back,’ ridicules the anti-humanitarian ideas of SOS with quotes submitted from supporters to our website. – “In the second movement, ‘Turn Our Back,’ we illustrate America turning its back on hate-groups and hate-speech, with the decisive show of disrespect coming from silhouettes labeled according to the models’ ancestry: Native-American, Mexican-Irish-American, Cuban-American, etc. On June 25, 2005, over 600 peaceful demonstrators sang, danced, chanted, and beat drums to urge tolerance and support for our client, artist Judith F. Baca, Founder and Artistic Director of SPARC (Social and Public Art Resource Center). The City of Baldwin Park presented Ms. Baca with a proclamation to keep the Danzas Indigenas monument intact and declared the matter closed. Sixty members of the anti-immigrant hate group Save Our State—Sink Our State would be more appropriate—staged another unsuccessful protest against the Danzas Indigenas public art monument in Baldwin Park and Ms. Baca. On May 14, 2005, twelve to twenty outside agitators from the hate group traveled to Baldwin Park where they encountered over 1,000 supporters of the monument. The hate group has charged that the twelve-year old monument to multicultural understanding is racially charged, seditious, and anti-American. reflect the dreams, past, and future of Baldwin Park. The hate group using terrorist tactics threatens to take action if two statements are not removed. The group’s diatribe against one quote reflects its own ignorance: “It was better before they came.” The group berates that statement because it laments the presence of whites in America, but in fact the quote is from a non-Hispanic white resident who was speaking about Mexican immigrants arriving after World War II, according to Ms. Baca. The ambiguity of the statement as it appears on the monument is the point: about which “they” is the anonymous voice speaking? County-based hate group “was bringing one.” The group “threatened my life and told me they were going to bury me in brown soil,” said Councilman Van Cleave, the only non-Hispanic White on the council. All members of the council have received death threats. The hate group’s web site is filled with violent images of a man shooting at the viewer, people used as target practice, and people beaten and bloodied. The City Project will continue to represent Ms. Baca and SPARC so that artists, public officials, and community members will not be left to face death threats and attacks on their well-being because of a work of public art that was created in a public process, and approved by an art committee in the city and the Metropolitan Transportation Authority. A universally acclaimed artistic and cultural masterpiece, the Watts Towers were constructed by hand over a 33-year period by Simon Rodia, an immigrant artist. The City Project supports the ongoing efforts to restore and maintain Watts Towers. “I’ve lived here all my life, and there are many places I love around the city. But whenever I go through South Los Angeles, I always try to catch a glimpse of Nuestro Pueblo, which is Spanish for ‘Our Town.’ It describes a series of towers that rise over Watts like some improbable dream. The Watts Towers were a 33-year labor of love, built by the Italian artist and immigrant Simon Rodia. He used simple tools and cast-off materials. He worked without the aid of scaffolding or the benefit of cultural and architectural designs. And he raised his towers up, from the ground up. And for over half a century, the Watts Towers have stood. They’ve withstood natural and man-made catastrophes. They’ve survived despite the efforts of critics and the ravages of earthquakes and the proximity of civil unrest. And they’ve stood. They’ve stood as both a tribute to individual imagination and as a monument to the power of difference. Seen from afar, the Watts Towers rise like the spires of a great cathedral. But close up, you’re immediately drawn in by the amazing complexity of their design. Embedded in those walls are thousands of cast-off objects, representing every imaginable color, shape, texture and form. They’re made from bed frames and bottles and broken glass-pot shards and ceramic tiles. When I see those towers soaring over Watts, my thoughts always return to the pieces that make up that beautiful whole. To the value in those things that people, in their haste, are apt to cast away. To the awesome power of disparate elements working together to achieve such dazzling harmony. Fellow Angelenos, I will never forget where I came from. And I will always believe in the value of every Angeleno. This is truly our town. And we all have a contribution to make.